In an uncharacteristic move, I decided to make a vegetarian Christmas dinner this year. I chose this delightful recipe is from Vegetarian Cooking for Everyone and paired it with roasted baby carrots (which were absolute hell to peel but very tasty) and a fennel, orange, and butter lettuce salad. I had never made a galette before and loved its free-form nature. You can leave more of it exposed than I did if you like, or you can close it up completely. 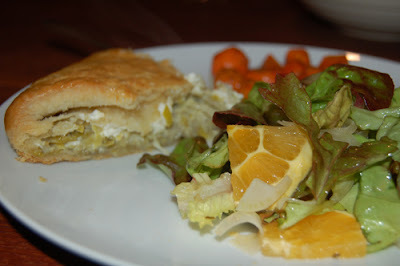 Here are some photos of the process and of the resulting galette which tasted as good as it looks! The recipe follows. The choice of recipes was inspired by these lovely, tender-looking baby leeks I found at Monterey Market a few days ago. Here they are chopped up and ready to get sauteed. I love the vivid colors! 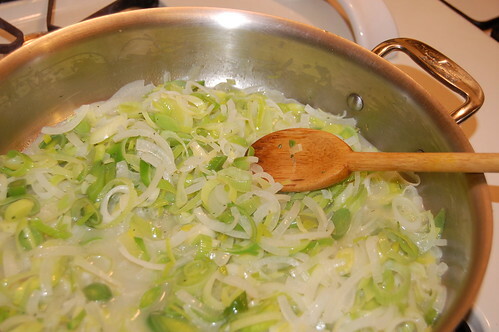 Below: sauteeing the leeks in butter and wine. 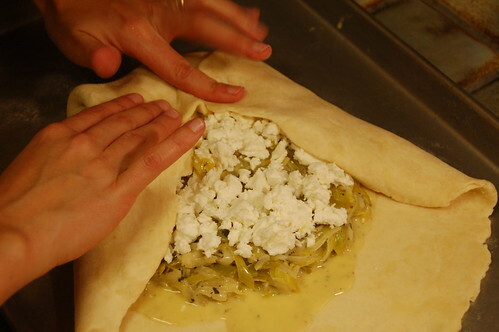 Below I have rolled out the galette dough into a rough circle and added the filling, leaving enough dough around the edges to fold it in over the filling after I crumble the goat cheese on top. 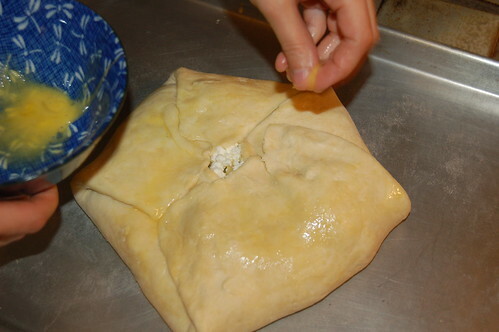 After adding the crumbled cheese, it's time to close up the galette - you can make as many or as few pleats as you like. 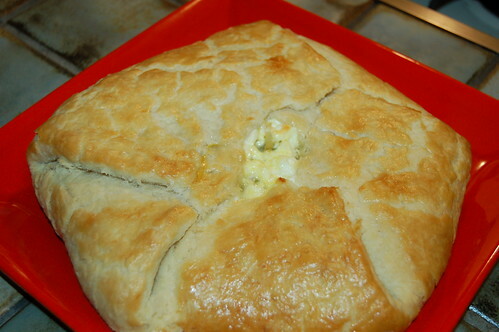 The dough has a LOT of butter in it so it will stick to itself without any problems. 1. Thinly slice and wash the leeks. You should have about 6 cups. 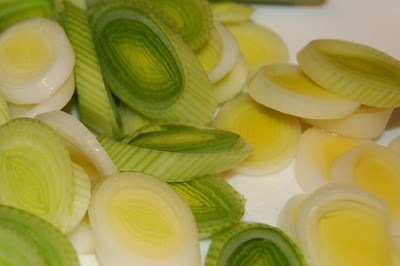 You can also substitute a sliced onion or bunch of chopped chives if you don't have enough leeks. 2. Melt the butter in a medium skillet. Add the leeks, thyme and 1/2 cup water. Stew over medium heat, stirring frequently, until the leeks are tender, about 12 minutes. 3. Add the wine and continue cooking until it's reduced, then add the cream and cook until it just coats the leeks and little liquid remains. Season with salt and pepper. 4. Let cool for 10 minutes, then stir in all but 1 tbsp of the beaten egg and 2 tbsps of the parsley (or all the tarragon). 5. Preheat the oven to 400 degrees. Roll out the dough for one large galette on a counter or upside-down cookie sheet and transfer to a greased baking sheet. 6. 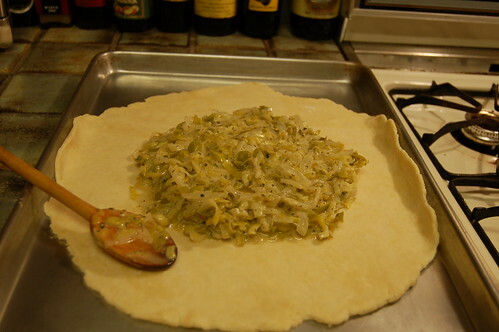 Spread the leek mixture on top of the dough, leaving at least a 2-inch border around the filling. Crumble the cheese on top then fold the dough over the filling (again, depending on how large a border you leave, you can close it up completely or leave some of the filling visible in the middle). 7. Brush with the reserved egg and bake until the crust is browned - 25-30 minutes. Remove, scatter the remaining parsley over the top, and serve. The galette sounds really tasty. The crust looks like it came out nice and golden brown and light and flaky. We made this for the Slow Food Seacoast Potluck this evening and it was a huge hit! It came out wonderful!